State Fire Marshal Stephen D. Coan and Massachusetts Firefighting Academy Director Edmund M. Walker are pleased to announce the graduation of the 188th class of the Massachusetts Firefighting Academy�s sixty-day Recruit Firefighting Program on September 24, 2010. �This rigorous professional training provides our newest firefighters with the basic skills to perform their jobs effectively and safely,� Coan said. The Massachusetts Firefighting Academy, a division of the Department of Fire Services, offers this program, tuition-free. The ceremony took place at the Assabet Valley Regional Technical High School in Marlborough, MA. 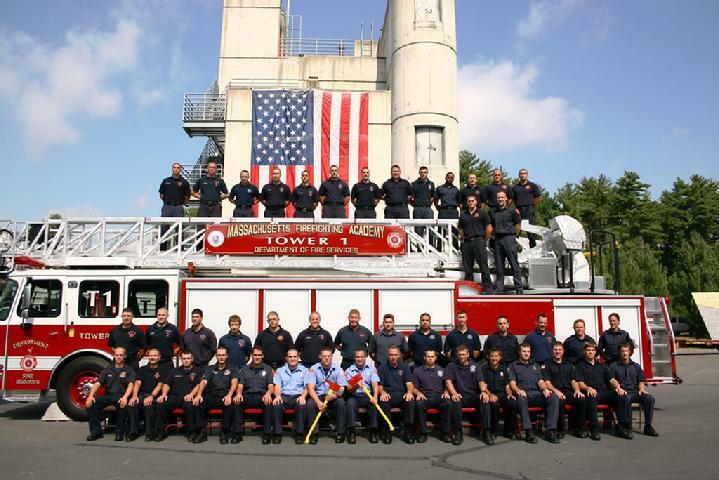 The 46 graduates, 44 men and two women, represent the 20 departments of: Acton, Attleboro, Belmont, Beverly, Billerica, Canton, Devens, Fitchburg, Framingham, Holbrook, Holden, Ipswich, Longmeadow, Lowell, Milton, North Attleboro, North Reading, Oxford, Stow, Swampscott, Wakefield, Walpole, West Springfield, Westfield and Wilmington. Massachusetts Fire Academy Deputy Director Mark Pare was on the Providence Fire Department for 29 years, retiring as assistant chief. He served from 2008-2010 as chief of the Wrentham Fire Department and joined the Fire Academy as deputy director in May 2010. He has been an instructor with the Rhode Island Fire Academy for 20 years and is a graduate of the Executive Fire Officer Program at the National Fire Academy. The Beverly Fire Department will hold its annual Open House on October 9 2010. Please come by and watch demonstrations of Vehicle Extrication and High angle Rescue while learning about the Fire Department and Fire Safety Topics. Doors open at 1100 am and close at 200 pm. Don't forget the kids!! See the flyer below. At 1826 on Saturday, September 11, 2010, Truck 1 was dispatched to the area of Park St by the Franco American Club for a report of a truck fire. Responding from River St, Truck 1 arrived to find a 2000 Ford F150 in a parking lot with fire engulfing its engine compartment. Captain Paul Labelle, Lieutenant Kevin Smith and Firefighter Mike Halloran extended 100 feet of hose from Truck 1 and knocked down the fire before it could spread to any adjacent vehicles. The vehicle suffered heavy fire damage to the engine compartment and moderate fire damage to the passenger compartment. The cause of the fire is undetermined. Multiple grass fires were cause alarm for Beverly residents on Sunday, September 5. The first occurred on Manor Rd near the 900 buildings after multiple residents reported fires in the woods behind their building. Engine's 5, 3 and Car 2 responded to investigate. 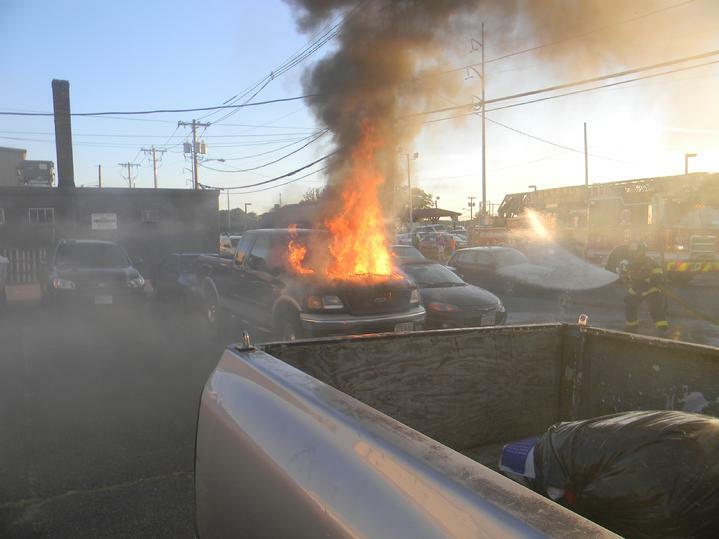 Upon arrival, Engine 5 found heavy smoke in the area and a single fire adjacent to a nearby parking lot. While Engine 5 worked to extinguish the fire by the parking lot, Car 2 searched the area with police officer's to insure there were no other fires. None were found and Engine 3 was returned to its quarters. It was reported that the fire was intentionally set and Beverly Police Officer searched the area for a suspect. Shortly after the Manor Rd incident, a trailer fire was reported behind the McKeown school on Balch St. Upon arrival, Engine 5 found a smoky grass fire adjacent to the trailer, but no fire extension to the trailer itself. Lt. Donald Philpot worked with Firefighters Ross McCulloch and Brian Miller to extinguish the fire before any damage to the trailer could occur. Firefighters on Engine 1 were dispatched to a report of a stabbing on Grant St the evening of Friday September 3. Upon arrival, crews assisted Northeast Regional Ambulance with three victims, two with multiple stab wounds. All three victims were conscious and alert when transported to Beverly Hospital for treatment of their injuries.